Columbus: Can we become a tech center? I read an awesome post yesterday from a startup founder from Atlanta who’s moving his operation’s headquarters to California. As I read about the challenges Atlanta poses to tech startups, I couldn’t help but reflect on my own similar experiences. A few years ago, I had a chance to ride along with a software startup company here in Columbus, OH. I wrote our product’s first lines of code and grew an incredible team of developers who helped grow the product. Life was challenging, and the path was steep, but we had nowhere to go but up. Then, funding happened. Our CEO spent tireless days pounding the pavement in central Ohio looking first for Angel funding, then for VC funding. We spoke with a number of firms in ever-widening concentric circles around Columbus, but we never found anyone in this area who was looking to take on an early-stage tech startup, and we ended up being funded by a couple VC firms from Texas. I’m not sure that the distance is what led to our demise, but I can guarantee that it didn’t help. If nothing else, the amount of money we blew on airfare and hotel rooms would have kept our lights on for another couple months. So what was it about central Ohio that made it a “dead zone” for software startups? The answer is that Columbus wasn’t unique. “Dead zone” is, in fact, the default state everywhere you go. If it weren’t for Silicon Valley, we never would have understood that there was an alternative. Even six or eight years ago, there were precious few communities that could claim to be startup-friendly. I’d visited Silicon Valley in the go-go late 90’s, and I was absolutely blown away by the entire environment – everywhere you turned, you’d see dot-com stuff, but this was before most of the rest of the world realized there *was* a dot-com. By the time we were seriously looking for VC funding in 2002, the Silicon Valley VC’s were still the 800-pound gorillas, but we were starting to see signs of life in New York and the Austin, TX area. North Carolina had its Research Triangle, but at the time, that was mainly geared toward attracting big companies and big facilities, so it didn’t do us much good. As it turned out, Austin was the best we could do. As volatile as the tech economy has been, it’s still wildly more successful than watching manufacturers shutter their factories, so you’d think that every State and local government in the nation (including Columbus) would be waving their magic wands to make their regions into the next tech mecca, and yet so very few communities have made this leap. Critical mass. You simply need a concentration of tech investors and startups that are needed to make a tech community work. Jeff’s point that this shows up in the lack of a market rather than a lack of money is spot-on. When you’ve got a bunch of people who aren’t used to seeking or investing VC funds, who don’t have the experience to know good from bad — in short, people who haven’t been there — it’s going to show up as a really tight financial environment. This is not completely unlike what we’re seeing in the global credit markets, but it’s driven as much from inexperience as it is from distrust. Velocity and volume. These drive a tech market. This is how people get experience, both as entrepreneurs and as investors. In Silicon Valley, we’ve certainly seen the irrational exuberance that drove people to fund everyone with a slide deck, and most people would agree that there’s such a thing as too fast and too loose, but you can’t ignore the side-effect that lots and lots of people there are really comfortable setting up VC deals, and the same can’t be said about central Ohio. Communication and networking. Silicon Valley led the world in innovating communication and networking among technology innovators, and I believe this was no small factor in their early success. When you have a connected community, there are a million opportunities for people to reach out to help one another, and that propels innovation and productivity. The tremendous challenge here, of course, is that this is a chicken-or-the-egg problem. How do you reach critical mass and velocity and volume when you’re essentially growing organically? Wrong. The best news of all for Columbus is that I’ve seen a ton of improvement in the last couple years, and the good news is accelerating. The most visible signs of change are in communication and networking, where the Columbus communitity seems to be embracing web 2.0 technologies to drive face-to-face networking. If you hook into these communities, there’s a ton of chatter about what Columbus technologists and business leaders are doing. A year ago, none of this was transparent, which really limited the networking effect that’s so vital to the growth of this environment. We saw a great example of this new energy about a month before our recent election. The recent 2.Ohio event came together incredibly quickly, and brought some real headline talent to Columbus. If you’re in Columbus, check out the Columbus Tech Life wiki and follow some of the blogs and twitter profiles you can find there. 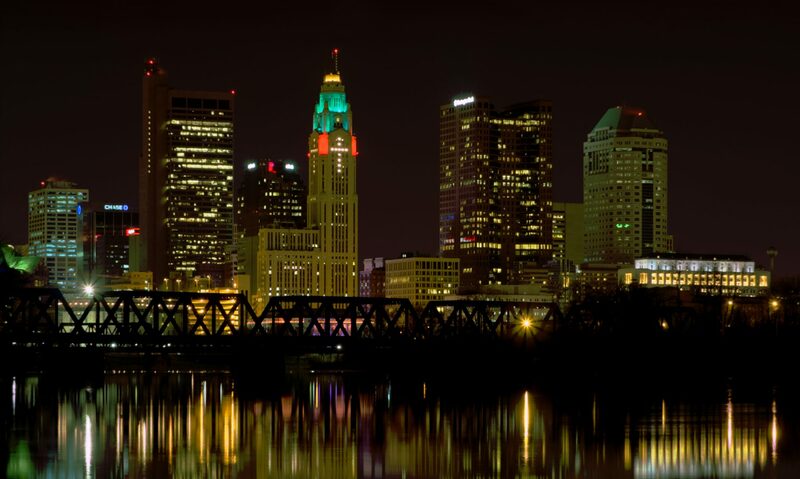 Check out the Columbus Tech Life blog. Come out to the next IT Martini meetup and do some networking. Watch sites like TechColumbus and Platform Lab for events you’re interested in. Don’t get me wrong – there’s still a ton of work to do here. I’d love to see more visibility for all the participants in the startup ecosystem. For example, Microsoft just announced their BizSpark program, which helps startups with free software, but also by hooking them up with a partner who’s there to educate and support the startup. I’d love to see a couple Columbus-area companies set up as BizSpark partners so the next generation of startups doesn’t have to go to California or Texas to grow. Columbus readers, what other resources exist to connect our tech community? I Heart Startups (and so does The TechSet and Microsoft BizSpark). Check out the itinerary: New York, Phoenix, Austin, LA, Silicon Valley. Coincidence? I think not. Come on, Columbus – let's get on the radar. I've talked to several people locally about this very issue and enjoyed your post. Who believes in us, our ability to do great things, attract and retain the talent and collaborate to create innovations that help us live up to Forbes' claim that we are the up and coming #1 technology city? I feel strongly that we need to backcast Columbus' future. With a strong coalition of people who grab onto the vision and create mechanisms for it to happen, then we can achieve the bragging rights. I'd love to see more passionate people get involved like we are starting to see with Columbus TechLife, Tweetup, Social Media Cafe, and others. I appreciate your efforts to illustrate these ideas in any capacity. Thanks, Sandy. There's more energy in this space than I've ever seen in Columbus – pretty exciting stuff, and badly needed for Ohio's economy. Check out the Columbus tracking page. Not all tech, but a lot of tech and social media twitterers are on there. http://twitter.zappos.com/Columbus. If you're from Central Ohio, just ask me to be added. I'm @wyliemac on twitter. Excellent – thanks -I'd forgotten about that one.